Baltimore’s Inner harbor is a thriving, active place. It features amazing institutions like the Visionary Art Museum and the Museum of Industry. Harbor East offers diners a great diversity of gastronomic options. And sometimes it’s nice to blend in with the flocks of tourists to stroll the waterside, or take the water taxi to enjoy a panorama unavailable anywhere else in the city. One thing one does not do, however, is take a refreshing dip. The Herd is a tribute to all the citizens of Baltimore City who continue to hope for a healthy city and healthy waterways. It is a cluster of 400 luminous inflatable swim rings—similar in appearance to the floats used by swimmers at the seaside—laced together in a net to form a glowing multitude of creatures calmly bobbing in the shimmering ripples of the nighttime harbor. 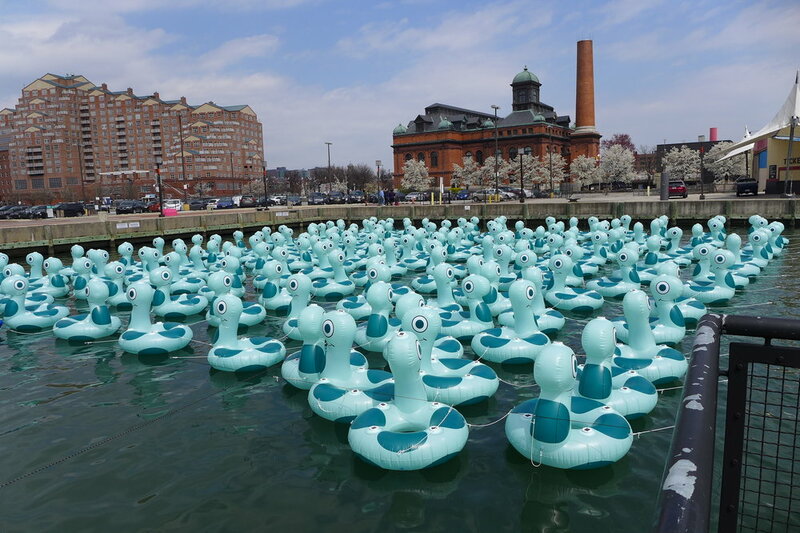 The Herd amused, confounded and delighted visitors to Baltimore City's annual Light City Festival from April 13 - 22, 2018. 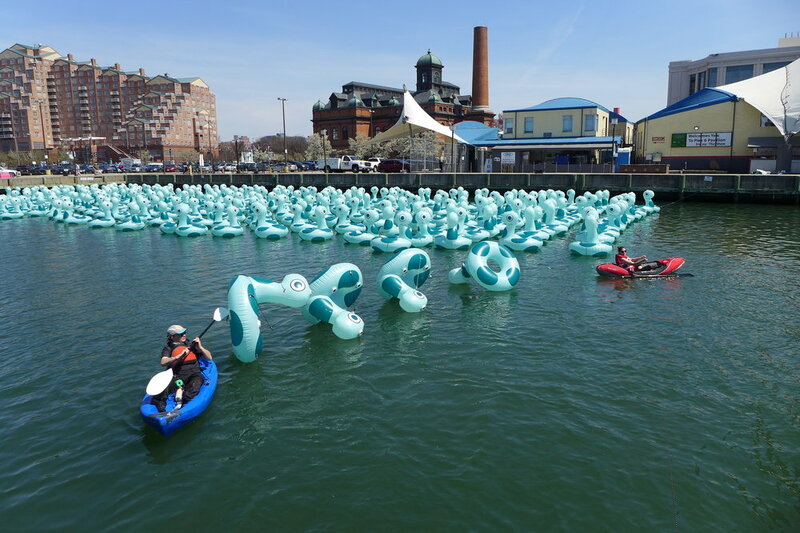 The artist launched over 300 solar powered inflatables into Baltimore's inner Harbor. The installation took three days to complete with a dedicated crew of artists and volunteers, and used over 6000 feet of rope to position and secure all of the inflatables in a 120' by 340' foot area. In the interest of carrying The Herd's message of water health beyond the Harbor and the Bay, the inflatables were sold during the festival to benefit three water-oriented Baltimore non-profits: Waterfront Partnership's Healthy Harbor Initiative, the Baltimore-based performance group Fluid Movement, and the Living Classrooms Foundation, ensuring that the art piece has a life of its own after the festival, and that the materials used in fabrication will be put to a good (and fun) re-use. The Herd raised over $2000 for our water loving non-profit partners. Fifty-two Herdlings were purchased by supporters during the festival and have been successfully re-homed, ensuring that these inflatables will continue to be loved and used, and will stay out of landfills. These donations will help these organizations continue their good work with our waterways and communities. The Herdling inflatables are still for available for sale now! For an in-depth view of the Herd's story, visit the Herd Blog. For the initial mission statement and proposal, go here. Follow The Herd on Instagram at #theherdpix. Interested in hosting The Herd at your festival? Please contact me here.